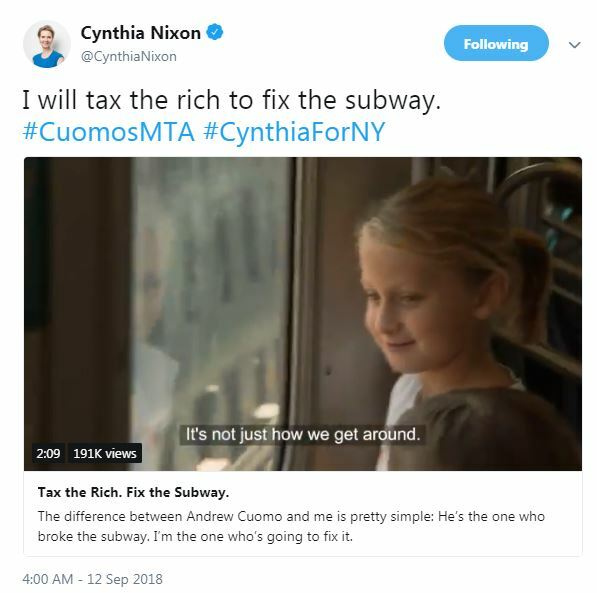 "I will tax the rich to fix the subway," Nixon tweeted on Wednesday. It's not the first time she's said that. Her tweet includes a short video, explaining that she takes the subway every day; the system on which New Yorkers depend is broken; and she will do something about it. "It's not going to be easy," she admits. "And it's not going to be cheap. But we don't have a choice." Nixon is running against incumbent Gov. Andrew Cuomo on a platform that includes single-payer health care; legalizing marijuana and ending mass incarceration and cash bail; investing in schools, not jails; universal rent control; and abolishing ICE. She blames him for the subway system's many problems. New York holds its primary election tomorrow (Sept. 13), and the candidate who wins -- either the lefty or the far-far-lefty -- is expected to win again in November.